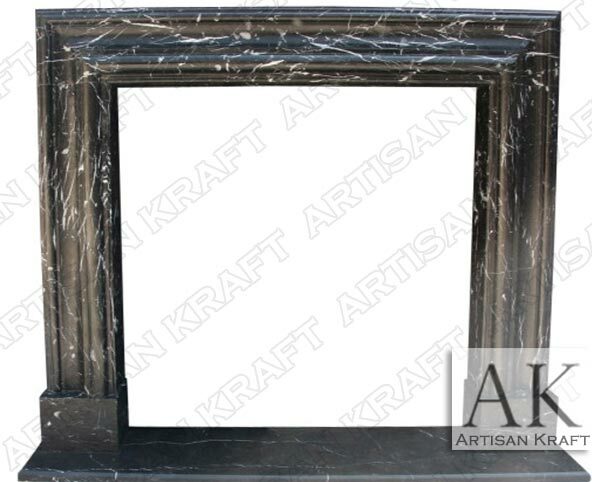 Modern Bolection Fireplace Surround is a marble frame style design. Craved from black marble giving it an even more contemporary style. The white veining in the dark black setting gives it an even more awe inspiring look. Here it is pictured polished but it can be made honed as well. Limestone is typically made honed but having marble honed gives it a different look. We offer this Modern Mantel with a shelf as well. Find it one the sale page, San Francisco Mantel. The frame design can wrap around the firebox or it can have inner panels meeting the firebox.